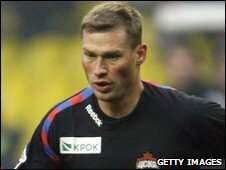 CSKA Moscow pair Sergei Ignashevich and Aleksei Berezutsky have been banned for one match after failing a dope test. Uefa also fined CSKA fined 25,000 euros for not adhering to anti-doping rules. Ignashevich and Berezutsky tested positive for a stimulant found in a cold remedy after CSKA's 3-3 draw with Manchester United last month. The pair have already served the ban as they were provisionally suspended for CSKA's Champions League match against Turkish champions Beziktas last week. The players and the club have three days from receipt of the written decision to appeal. However, Ignashevich and Berezutsky are already clear to play in the knockout round-of-16 matches in February. Uefa's rules allowed a maximum penalty of a one-year ban for using a substance named on the World Anti-Doping Agency's "specified" list. The players were permitted to take the cold remedy only if club doctors had informed Uefa of its use for therapeutic reasons. CSKA had claimed the two defenders were the victims of an error by the club's medical staff, who failed to register cold cures given to the players while on international duty. The club said in a statement: "Our medical staff had made a technical error, failing to disclose cold medicine Sudafed during a doping test on 3 November in Manchester." The players would not have returned a positive finding if the medical staff had filled out the correct therapeutic use exemption (TUE) form. A Uefa spokesman said the offence "was not a case of intentional doping to improve performance" but confirmed that the stimulant was on the banned list. CSKA will find out who their next Champions league opponents are when the draw for the knockout stage of the competition takes place at 1100 GMT on Friday.